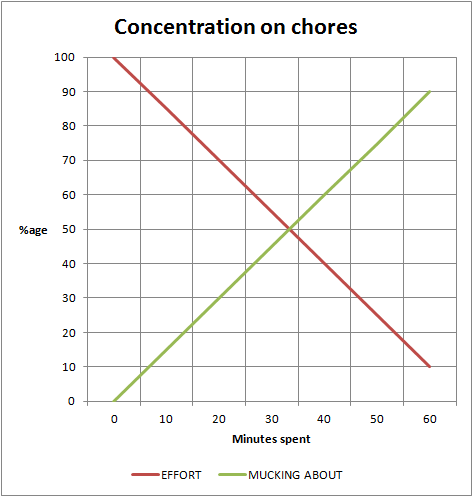 The graph above demonstrates my ability to concentrate on chores. Basically, when I start, I'm on it 100%, firing on all cylinders, taking that task down. But as time goes on, I start to get distracted. Some chores are worse than others. Putting clothes away, or washing up, for example, aren't too bad - I'll play something funny to listen to as I work, and I'm fine (at least until the show ends). But take a job like tidying a room where a bookcase is. It's a massive challenge for me to pick a book up, and put it on the bookcase without reading it for half an hour! Especially if my wife is in a different room, and I can hear her coming so when I know she's about to burst in on me I can pretend that I'm dusting the book or something! 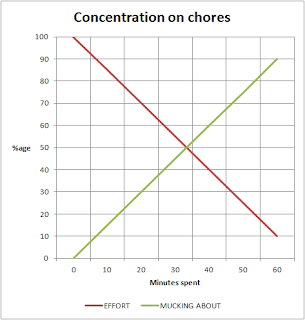 You see, I have an ethos of "continuous improvement" when it comes to doing chores. What this means is that as long as the place is better when I stop than when I started, I'm generally happy. If I've only ironed half the clothes, well it's better than when they all needed ironing. I do bits of this and that sitting down to rest all through the day and night.